Maybe you bought a baby shower gift off an online registry. Or maybe you googled "ovulation calculator". Or maybe a bunch of your friends have infants and you liked one of their posts. Whatever the reason, your Facebook feed is now flooded with ads for pregnancy and baby products, and it is the worst. 2) Under "Hide ad topics", click on "Parenting", choose how long you'd like to hide the ads, and toggle on that amount of time. 1) Go to your Account Settings. 2) Scroll to the bottom and choose "Ads". 3) Under "Hide ad topics", select "Parenting", choose how long you'd like to hide the ads, and toggle on that amount of time. 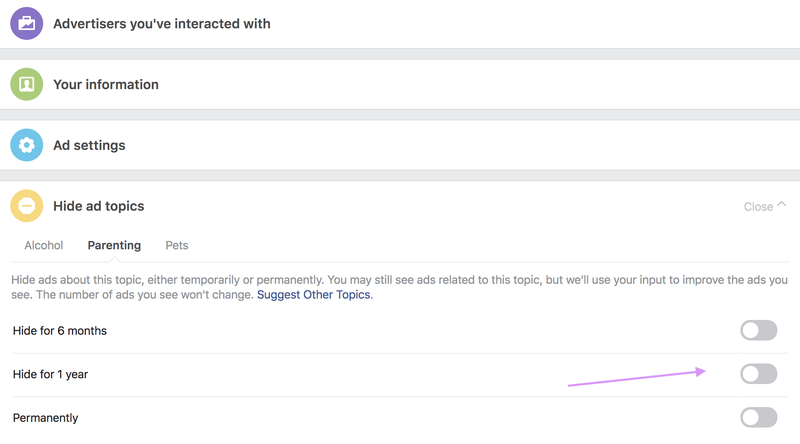 Facebook notes that you may still see ads related to the topic, but they will "use your input to improve the ads you see". The total number of ads you see on Facebook will not change, but hopefully, you'll see fewer posts promoting car seat monitors, sleep consultants and biodegradable nappies.